Anyone with Plex Fronted by Cloudflare? Cloudflare has deactivated your website from our network for a possible violation of our Terms of Service. available at Self-Serve Subscription Agreement | Cloudflare. If you have any questions, please email us at abusereply@cloudflare.com. Thank you for using Cloudflare. I gets auto reactivated usually but it is kind of annoying. 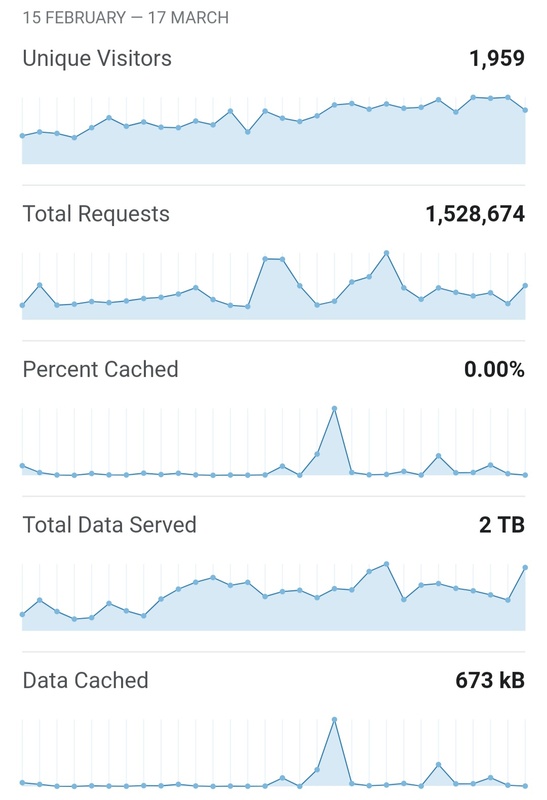 It doesn’t push that much traffic per month (1 TB roughly) but I don’t know how against the rules that is. That’s because you’re proxying a bunch of videos/movies through CloudFlare. Their system doesn’t really care if you’re only pushing like 50 GB/mo, but 1 TB is pretty stupid considering you’re (probably) on the free plan. Having said that, you’d need to upgrade to their ‘enterprise plan’ if you want to proxy anything more than a few pages and images. Hmm, that’s interesting. 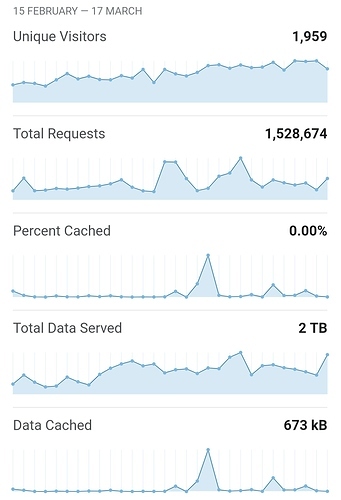 I have my Plex server running behind Cloudflare and I’m pushing several TB a month just fine, but the difference is probably that 0% of that content is being served via Cloudflare’s cache. I’m assuming that there’s something wrong with your configuration somewhere. Generally speaking, people push Plex over Cloudflare for improved peering and faster dashboard load times, so your media shouldn’t ever be cached with them, hence why I don’t believe they have an issue with it. My guess is that pretty much all of the Plex stuff is “non-HTML content” and is not “web pages as viewed through a web browser”. However if @Wolveix is right and the videos aren’t proxied, then I would have thought they’d be okay with it. Well, no idea if they changed stuff, since a few people pushed 2PB on the free account. I wonder now where they contact you. I don’t have any rules, at all. Yet for some reason it seems to have cached something and that seemed to happen yesterday. The cached bandwidth is minimal though. I don’t know what it was, they don’t have a URL report I can check. I guess I’ll just create an explicit “Cache nothing” rule for the entire domain and see what happens. What’s the advantage of using Cloudflare if they don’t actually cache anything though? One of the main features of Cloudflare is that they cache content in PoPs near your users. Are you just using it for DDoS protection? Since they still handle routing, users further away from the server still get seemingly better peering. Since I’m fairly close to the server, I can’t speak from experience, but a few of my users that live around the world reported better loading times etc. Plus TCP and SSL termination closer to the end user = win. Plex as it is can’t be cached anyway without crazy hacks anyway because it includes the device ID as part of the path to the content so you would essentially only be caching content that the same person would rewatch which is a minority of content. Aren’t you just increasing the number of TLS terminations that are happening? My guess would be that this would have the completely opposite effect. A few Plex clients also handle media streams in an unusual way causing unstable connections. Cloudflare makes a huge difference in this case. Usually, the middle mile (within the CDN’s network) and first mile (CDN to origin) are optimized as they’re on the backbone of the internet and has its persistent connection and other tcp related settings (congestion windows, buffers, etc) tweaked so the multiple terminations tend to not be an issue. Terminating once to a faraway origin is typically worse than terminating multiple times via a CDN due to these tweaks. I re-checked and had 0 rules. I added one to bypass cache and enabled developer mode which bypasses all of their cache. Let’s see how long it lasts after reactivation. do email the abuse email and ask. I never go over 30T but have not had any issues before, so I would be interested to know the reason they gave you for such little data. This is CF’s response. I don’t understand why i’d be flagged but other zones doing the same and pushing more traffic are not. It appears that our network engineers have deactivated your site multiple times due to abusive behavior e.g. video streaming. I don’t understand why i’d be flagged but other zones doing the same and pushing more traffic are not. Could be a matter of time. #Intentionally not hardened for security for player support and encryption video streams has a lot of overhead with something like AES-256-GCM-SHA384. #Reuse ssl sessions, avoids unnecessary handshakes. Turning this on will increase performance, but at the cost of security. #Use: openssl dhparam -out dhparam.pem 2048 - 4096 is better but for overhead reasons 2048 is enough for Plex. #Nginx default client_max_body_size is 1MB, which breaks Camera Upload feature from the phones. #Buffering off send to the client as soon as the data is received from Plex. #Example of using sub_filter to alter what Plex displays, this disables Plex News.